Anew is dedicated to The New Avengers, the 1970s "sequel" to the cult classic British series The Avengers. 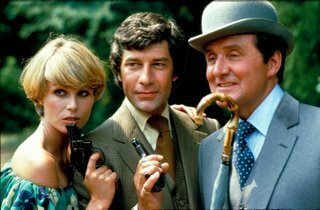 Filmed in Britain, France, and Canada, the series ran from 1976 to 1977, and saw the return of Patrick Macnee as John Steed, ably assisted by Gareth Hunt as Mike Gambit and Joanna Lumley as Purdey. Anew is a repository of material dedicated to this short-lived but important chapter in Avengers history. Updates: The latest site news. About: Information about the site itself, what you'll find here, how to contribute, and who's behind it. Archive: A repository of New Avengers press, photos, comics, scripts, merchandise, music, and more. Writings: Reviews, analysis, fiction, and the like. Links: Other New Avengers resources around the web.